Karen Dolmanisth has been invited by the jurors to participate in the Amherst Biennial. A work by Karen Dolmanisth. The Amherst Public Arts Commission (APAC) is pleased to announce the inaugural Amherst Biennial to take place in October and November 2010 at the Nacul Center, Amherst Town Hall, and additional satellite sites in town. Terry Rooney—artist, curator, Chair of the Amherst Arts Commission—felt it was time to change the paradigm of how artwork is seen. With so many galleries closing (especially wunderarts and Fiber Art Center), she decided to launch the Amherst Biennial. Rooney will curate this exhibit with Tony Maroulis, former co-director of wunderarts and Susan Loring Wells, former director of Fiber Art Center. The Amherst Biennial will install artwork in expected and unexpected places throughout the town, including the Nacul Center, Amherst Town Hall and other commercial spaces. Karen Dolmanisth has been invited by the curators to be in the Amherst Biennial. 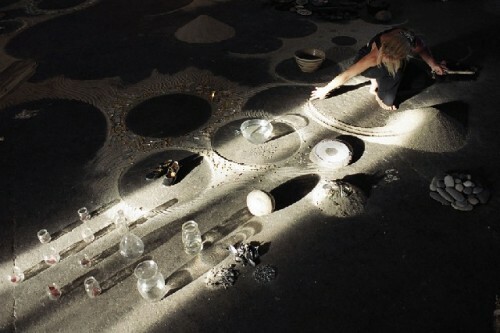 She is a site specific performance and installation artist. She has exhibited internationally and in NYC including Smack Mellon & Exit Art. She's also in the Pioneer Women exhibit which will be traveling from Tabla Rasa, NYC to Paper City Gallery, Holyoke this Summer. Interested artists are encouraged to send 3 digital images 92 for each 3D work), a resume and an application. The CD must be readable on both a Mac and PC formats. Images must be jpegs at 72 DPI with the largest dimension set at no more than 800 pixels. CDs must be labeled with the artist’s name, email address, and phone number. Deadline for all submissions is June 15, 2010 and applicants will be notified by July 15, 2010. Original artwork in all media is welcome. Applications can be downloaded from www.amherstma.gov. Or print out below. Terry Rooney received her Bachelor in Painting from SUNY, Empire State College where she apprenticed with Elizabeth Murray, Jack Tworkov and Marcia Tucker, founder of the New Museum. Terry curated her first exhibition with Marcia Tucker when she was still a student. Since then Terry has been an independent curator for dozens of exhibits including "Behind Closed Doors", (an exhibition about domestic violence), "Untold Stories & Native Voices" (Native American contemporary Art), & "Pioneer Women" (women artists who blaze new frontiers) which premiered in NYC last year and will traveling to Holyoke, Paper City Gallery in June. Susan Loring-Wells received her Bachelor of Fine Arts in Fiber Art from Boston University's Program In Artisanry. She holds a Master Weaver Certificate from the Hill Institute. Susan was the executive director of the former Fiber Art Center in Amherst, MA where she curated exhibits of contemporary fiber art, and served as juror. Tony Maroulis was former co-founder/director of Wunderarts, a commercial gallery devoted to high quality abstract and conceptual art by regional and national artists, in Amherst, MA, where he curated a number of exhibitions and programs with his wife Nora Trebbe Maroulis. Maroulis has worked for a number of cultural organizations including The Metropolitan Museum of Art, The Emily Dickinson Museum, and Museums10. He is an occasional contributor to Artscope magazine and serves on the board of the Pelham Cultural Council and is chair of Cultural Mass www.culturalmass.org. The Amherst Public Arts Commission (APAC) is pleased to announce the first Amherst Biennial this Fall (Oct/Nov 2010) at the Nacul Center, Amherst Town Hall and possibly additional satellite sites (empty storefronts and buildings) in town. We are looking for the best art created in Western Massachusetts during the last 2 years. Curators for this exhibit will be Terry Rooney, Chair of the Amherst Public Arts Commission; Tony Maroulis, former co-director, wünderarts gallery; and Susan Loring-Wells, former executive director of the Fiber Art Center. Send 3 digital images (2 each for 3D work), a resume and an application. CD must be readable on both a Mac and PC formats. Images must be jpegs at 72 DPI with the largest dimension set at no more than 800 pixels. Please label CD with your name email address and phone number. Deadline for all submissions is June 15, 2010. Applicants will be notified by July 15, 2010. We are looking for original artwork in all media welcome. A catalogue of the Amherst Biennial artists and their artwork is planned. Mail CD’s, entry fee (check payable to: Amherst Public Arts Commission for $25), and support materials to: The Amherst Public Arts Commission, c/o Jones Library, 43 Amity St., Amherst, MA 01002. APAC cannot return materials to the artists.